Juliet Madsen is a 2011 Volunteer Honorable Mention recipient. 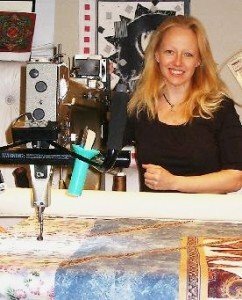 She is retired from the US Army and the founder of Stroke of Luck Quilting and Design. In 2004, her convoy was hit by a roadside bomb, changing the course of her life forever. With a traumatic brain injury, she has endured years of physical and occupational therapy. Juliet created the Ultimate Sew-In to raise money for Paralyzed Veterans and the 2010 Wheelchair Games. Along with other volunteers, Juliet created almost 500 quilts for other soldiers, like herself, injured in the War on Terrorism. She has been commissioned to create a wall quilt for the VFW to celebrate the restoration of one of the Vietnam Memorials in Washington, D.C.
2011 Honor Awards Banquet – Juliet Madsen, Volunteer Honorable Mention Award.